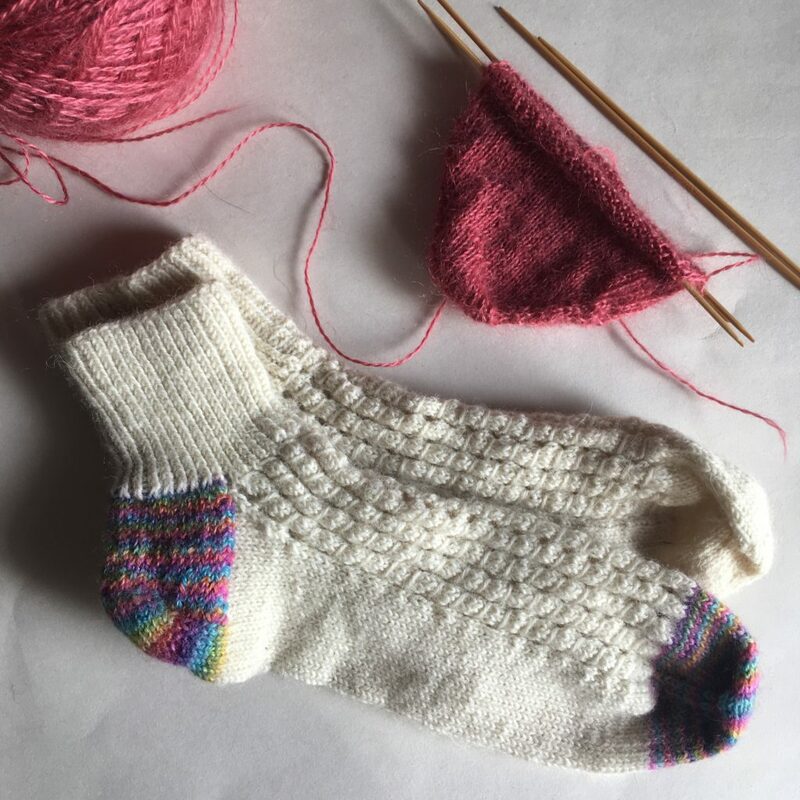 After an unplanned summer hiatus the podcast is back with an update on my sock experiment, some thoughts on the complex issue of affordability, a giveaway, my recent sewing exploits and a few inspirational gems. The podcasts is also available iTunes, PlayerFM and other podcast catchers. I thank everybody who sent me suggestions for resources about natural dyeing on linen and cotton, and would also like to thank the following podcast hosts for kindly recommending this podcast: Emily of Fibre Town, Eva of the Charm of It and Zoe of Pins and Needles. In this episode I update you on my sock experiment. I’ve knit a quirky control pair to accompany my Northern Yarn test pair. It’s a hybrid control pair that uses familiar to me West Yorkshire Spinners’ Signature 4-ply and some BritSilk, the new yarn from The Knitting Goddess for the heels and toes. I’m not the only knitter who considered this new yarn for its sock potential. 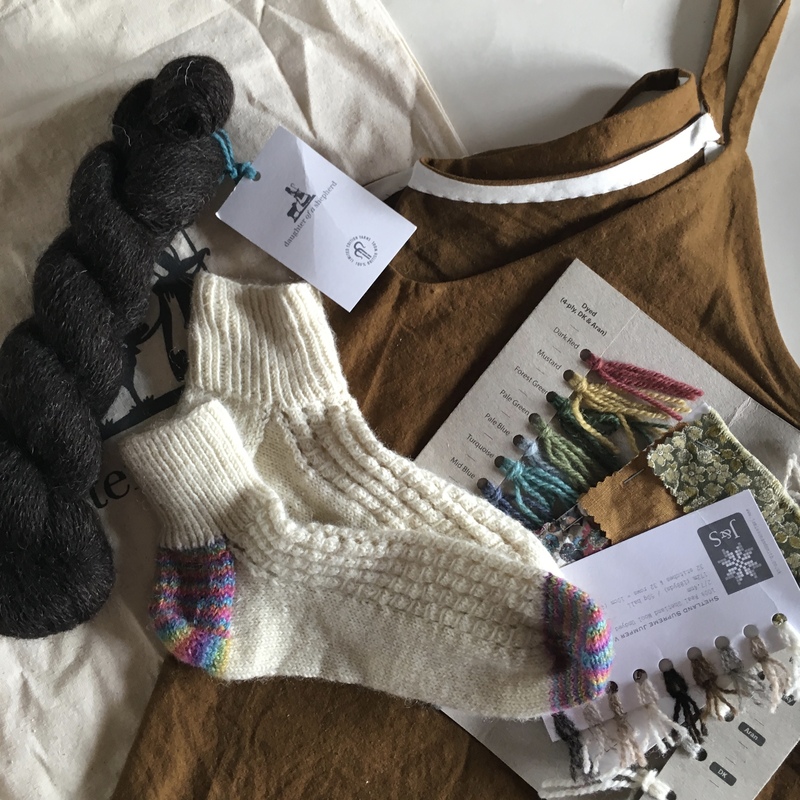 Read about how Maylin (aka Blithespirit4 on Instagram) wore a half sock in her hiking boots on her blog. I talk about why I admire The Knitting Goddess’ work and how I look forward to trying her Wensleydale/Shetland blend as part of this sock experiment at a later stage. I thoroughly recommend Louise Scollay’s interview with Joy of The Knitting Goddess in episode 75 of Knit British. I also talk about my next test pair, for which I am using Yeavering Bell 4-ply from Whistlebare Yarn and which will invoke the spirit of a seventh century Anglo-Saxon queen. Next up, in the context of a slightly laborious cardigan knit, I start to unpack an issue which one of my listeners, Johanna (aka revelinyarn), very validly raised: the issue of affordability when trying to source local wools or wools with a reasonable provenance. I acknowledge issues beyond my control, like the unit cost of wool, but choose to focus on what is within my control, like resource efficiency, and I share some thoughts on how I plan my wardrobe makes so I can afford to use responsibly sourced materials as much as possible. Like in the case of my Wainthropp cardigan, which I am knitting in West Yorkshire Spinners’ Wensleydale Gems DK range. As I plan to touch on cost and time issues again in forthcoming episodes, I thought it would be helpful to crowdsource ideas about what others do to balance cost with their desire for responsible materials so that we can all benefit from varied insights and inspiration and learn about affordable resources with a kinder provenance from around the world. I am linking this request for input to a give-away, which has been very kindly sponsored by Rachel Atkinson (aka Knittingtastic on Instagram) and the face behind the Daughter of a Shepherd wool. Rachel’s story is inspiring but also thought provoking about the potential impact of failing to value of local resources. 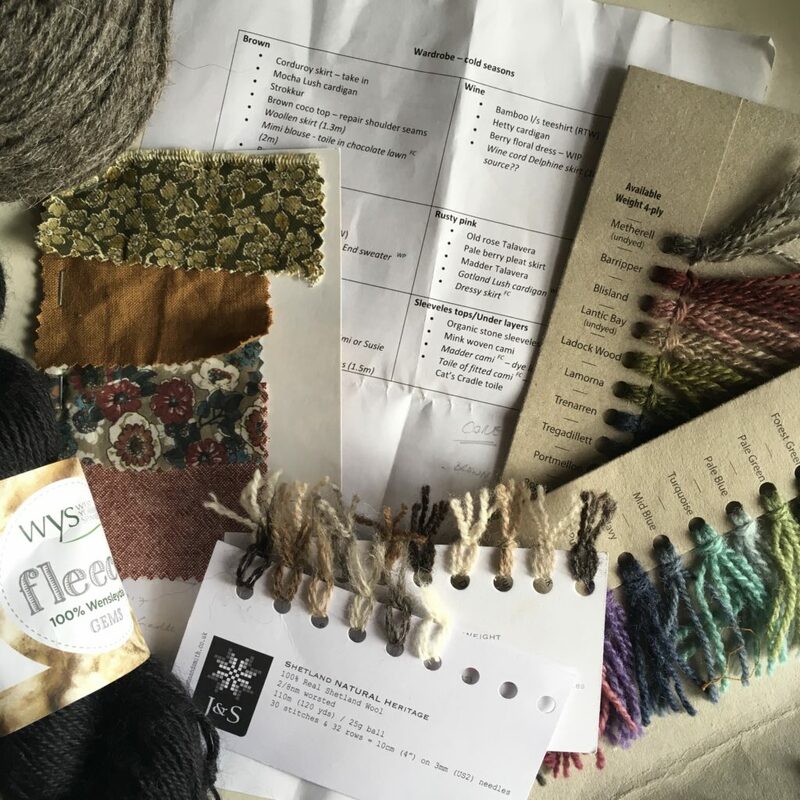 If you want to learn more about why she decided to take on producing yarn out of the fleeces from her father’s Hebridean flock herself, read her original blogposts Fleeced and Fleeced: the next steps. Or listen to Rachel talk to Louise Scollay of Knit British about the rationale and process behind her wool in Part 1 and Part 2 of the Wool Journey: Daughter of a Shepherd. 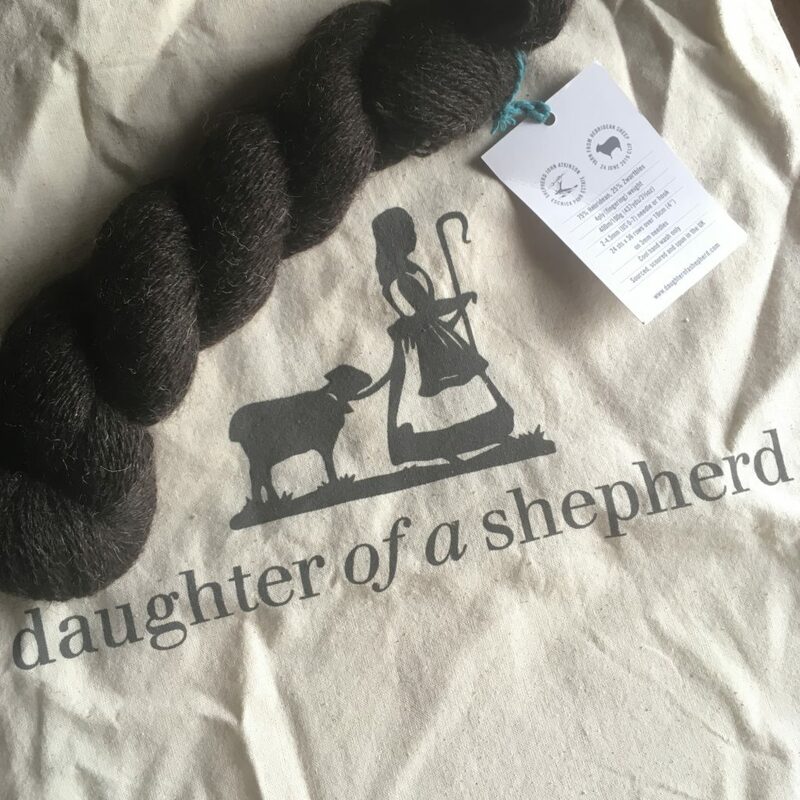 The prize for the give-away is a 100g skein of Daughter of a Shepherd 4ply (75% Hebridean, 25% Zwartbles) and a tote bag. 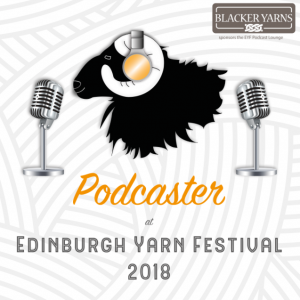 To enter simply respond to the prompt in the thread Affordability – Sourcing responsibly produced wool or fabric without breaking the bank in the Ravelry group for the podcast. If you are not on Ravelry but want to enter, you can post a comment on this blog post and I’ll copy them over individually. Apologies, I can’t include suggestions on Instagram. The give-away thread will stay open till 30 September 2017. 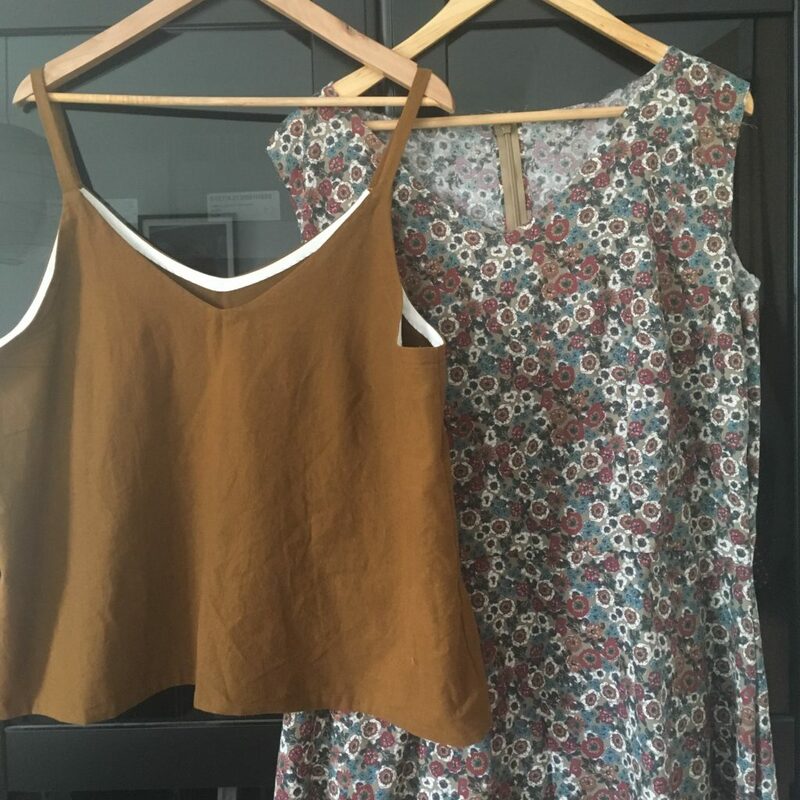 On a lighter note, I share my recent sewing exploits and how I am tackling tops that actually fit me. Cat’s Cradle Dress by Decades of Style. Episode 8 of East London Knit’s podcast, by Renée Callahan, includes footage of artisans in Portugal, whose tools and equipment are a fabulous reminder that the crafts we love are not just possible thanks to fabulous materials but also due to the humans instinct and ingenuity for tool making. For complete transparency, I received a mini-skein sample of BritSilk free from Joy of The Knitting Goddess to review on Instagram and Rachel of Daughter of a Shepherd kindly gave me the prize for the giveaway by way of sponsorship. That said, I am happy to recommend both these products as I have bought wool from them before and really rate these yarns and their work more generally. Alice, Thank you for this advice. If you think it’s worth holding off with the Yeavering Bell, I’ll take your advice. I had hoped to pick up a skein of your Cuthbert sock yarn at Yarndale anyway to see how it compares but alas will not be able to make it so I’ll contact you directly instead. Question: Community Supported Agriculture (CSA) opportunities are increasing and emerging for small niche producers in my area of Pacific Northwest (Oregon, USA). However, fiber farms and shepherds seem hesitant to use the model for fiber distribution. Have fiber CSAs emerged yet in the UK? As one who is living well below the poverty level on fixed Social Security income (pension I think you call it there? ), a combo crowdfunded/patreon/csa hybrid would actually be an option in my budget. Craftiness seems a gift of embedded innovative imagination, so I’m often surprised that we chat so little about fiscal and economic creative alternatives? I’ve not heard of any CSAs related to fibre in the UK. I suspect this avenue has not been explored in any great way here because a/ spinning is a very minority interest (think nano interest rather than micro) and b/ there is a central Wool Marketing Board that many farmers use to sell their fleeces. It’s aimed at bulk/commodity sale of fibre rather than maximising profits for breed specific fibres. Whilst the prices available through this board are pitiful, many farmers focus on meat production and fleece is viewed as a cost rather than opportunity. I am not sure if there are any CSA type approaches elsewhere in Europe. I’ll make some enquiries. Thank you Meg. I missed this reply earlier. Thanks for heading me back here. The variety of platforms make me a bit dizzy at times. CSAs for produce, dairy, and other edibles appear to be a neighborhood version of crowdfunding here. Especially successful for startup capitalization efforts. We too have all manner of ag boards, the govt sponsored one seems to be the most damaging to small farmers. None deal with the important politics of land use and land ownerships. Mostly meat breeds on larger farms. However, there are increasing number of heritage/heirloom breeders and fiber enthusiasts here in the Pacific Northwest I’m expecting some response even tho it may take me a while for inquiry. No centralized association, many small local groups and even more indie producers to identify. I will share what I find. If there are none, I will do my best to initiate something. Oregon is gifted with two diverse ecologies (I include the coast with the wet west), both welcoming to variety of breeds of sheep and more recently popular camelids especially alpaca but also angora goats (and angora rabbits!). While suburbanization is full on, there are still the possibility to buy small farms. There is also a huge wannabe “homestead” subculture here with expectations of selfsufficiency on 5 acres or less. Central and Eastern Oregon (dryer high desert-like clime) have been providence of beef cattle ranchers but that market is failing not so gradually and that culture is aging out. I predict remarkable changes here and highly recommend anyone interested in wool/fiber production (either wet western or dryer eastern Oregon) look into opportunities here. And there are new regional organizations support Women In Agriculture. There are also HUGE amounts of public lands in the PNW that can be accessed for agriculture/ranching. There are few if any restrictions for non-citizens purchasing land in the USA. Intuitively I feel there must be plenty of other women like me who would gladly purchase “shares” in wool production for our modest needs. To me this is ecosensible and encouraging to niche markets as well as creating more access as well as innovative and creative use of waste products. For example, I have a doll making project/exploration that requires wool lint which is usually a waste product off mills. So I have just started making a list of regional small mills for inquiry into what they do with their waste lint. For a creative “crafty” person possibilities are endless. Forgive my babbling, I get excited when conceiving a more intimate relationship between creative making and local environmental and economic problems.